Chester county voted in election districts composed of several towns. These districts were numbered but more commonly referred to by names derived from the locations where voting took place (ie-a tavern, schoolhouse, individual's farm, etc.) For more information, see "History of Chester County, Pennsylvania" by J. Smith Futhey and Gilbert Cope, 1881. 224-226. 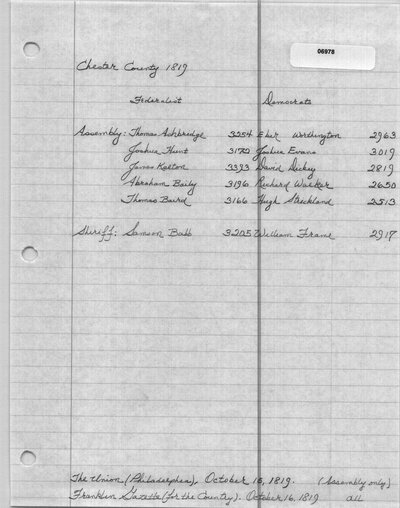 The Der Readinger Adler (Reading, PA), October 26, and The Berks and Schuylkill Journal (Reading, PA), October 23, list 3172 votes for Joshua Hunt, 3302 for James Kelton, 3196 for Abraham Baily, 2963 for Eber Worthington, 3019 for Joshua Evans, 2819 for David Dickey, 2650 for Richard Walker, and 2513 for Hugh Strickland. The American Republican lists 147 votes for Abraham Baily. The American Republican lists 178 votes for Abraham Baily. The Union. United States Gazette and True American (Philadelphia, PA). October 15, 1819. The American Republican (Downingtown, PA). October 19, 1819. Village Record, or Chester and Delaware Federalist (West Chester, PA). October 20, 1819. The Berks and Schuylkill Journal (Reading, PA). October 23, 1819. Der Readinger Adler (Reading, PA). October 26, 1819. Franklin Gazette (Philadelphia, PA). October 27, 1819.